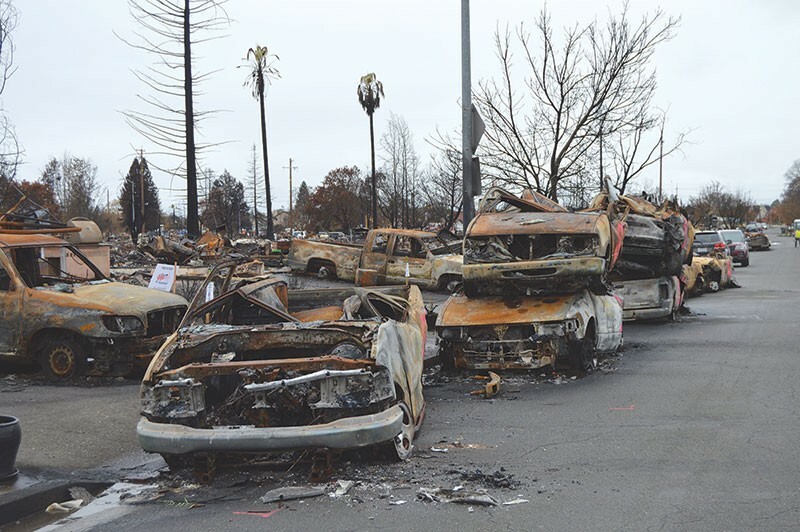 ASH KICKER The disaster clean-up firm AshBritt and Rebuild Northbay have donated $450,000 to rebuild a wall along fire-damaged Hopper Avenue in Santa Rosa. Last month Rebuild Northbay founder Darius Anderson was in Washington, D.C. Anderson posted on Facebook that he was in the capital "advocating with caring elected officials and concerned business leaders to help the fire survivors of the 2017 fires." He did not elaborate on who those business leaders were. Anderson went on share a group photo, which included a couple of caring local officials—including Santa Rosa Mayor Chris Coursey and Sonoma County Supervisor David Rabbitt. Anderson's trip came on the heels of news that Rebuild Northbay had "partnered" with disaster-recovery giant AshBritt to donate $450,000 to rebuild a concrete-and-wood fence along Hopper Avenue in Coffey Park. It's a pricey deal: the remains of the current wall on Hopper must first be demolished and carted off before any new wall can be constructed. The move was heralded by Coffey Strong in media reports about the outbreak of corporate altruism on AshBritt's part. Rebuild Northbay is the nonprofit formed by Anderson and has positioned itself as a post-fire clearinghouse of contributions from individuals and corporations. Roughly speaking, Rebuild exists to help provide bridge funding for fire-related projects and alleviate pressure on local budgets in the process. But local union advocates want to know why AshBritt is even operating in the North Bay at all? "They are a low-road, non-union, right-wing, ambulance-chasing company," says Marty Bennett of North Bay Jobs for Justice. The firm's arrival locally was met with skeptical eyeballs from the local labor movement, which pushed earlier this year for pay equity for workers hired to conduct the cleanup. AshBritt has been on-scene in the county during clearing of debris from the fire sites. The company has had a pre-positioned contract in the region for the past four years, pre-dating the 2017 fires. AshBritt Environmental has been a go-to company for FEMA and the Army Corps of Engineers since Hurricane Katrina hit the Gulf Coast in 2005 and nearly destroyed New Orleans. With the impact of Hurricane Florence in the Carolinas hitting home—and North Bay residents anxiously waiting out fire season—it's worth asking just what is the connection, if any, between Anderson and AshBritt. The company says there is none. The arrangement raises questions about who, if anyone, stands to gain from it, besides the residents of Coffey Park. One leading candidate out the gate is James Lee Witt, whom Anderson previously tapped to head his nonprofit. Witt showed up in Sonoma County as a sort of goodwill ambassador who counseled local officials on how to get the recovery right. He has since moved on after a brief stint. Witt remains a disaster-capitalist power broker in his own right. He is the former head of of FEMA, and a so-called Friend of Bill from Clinton's terms in the 1990s. As the Bohemian reported earlier this year, he's also the head of several disaster-services companies, and private-equity funds devoted to attracting investments into large infrastructure projects. AshBritt was created by well-connected Republicans in the 1990s, an effort spearheaded by former Republican National Chairman Haley Barbour. The company has functioned as a meta-contractor of sorts for other disaster-services companies that do the cleanup work after Mother Nature (or a downed PG&E pole) strikes. AshBritt was the subject of a New Jersey state inquiry over billing following Superstorm Sandy. When that storm ravaged the Northeast in late 2012, AshBritt was awarded a so-called "piggyback" contract to the tune of $150 million to provide debris-removal services in New Jersey, under the governorship of Chris Christie. A "piggyback" contract means that New Jersey was able to utilize an Ashbritt contract that was already in place in Connecticut. That contract was initially subject to typical procurement requirements. According to press reports from the Garden State, Christie hired the company after a nudge from Barbour, and immediately after the storm—under "exigent circumstance" rules that don't require competitive bidding for a new contract. FEMA documents indicate that the agency doesn't favor "piggybacked" contracts. State investigators subsequently found that because of errors committed by the monitoring firms, subcontractors working for AshBritt overcharged the state by some $300,000. The money was refunded to the state by AshBritt, says Moskowitz, "and we didn't ask the contractors to pay it back." The companies identified in the state comptroller's investigation that looked into the over-billing issue were Louis Berger, Arcadis—and Witt O'Brien's. Now AshBritt has a partner in Anderson, which at first blush may rough-out the contours of the post-disaster deal-making process in the region; an AshBritt statement from CEO Brittany Perkins that first appeared in the Press Democrat said the company was "proud to partner with Rebuild Northbay and Coffey Strong." AshBritt spokesman Gerardo Castillo says in an email that the wall-building project is a go and that the company is "fully committed to the contribution and we are looking forward to the commencement of this construction." He adds that local contractors Mountain G and Wolff Contracting are on standby, "ready to begin work when the Coffey Strong project managers give them the green light to move forward." He says the $450,000 donation is part of the company's mandate. "We have a long-standing record of doing this throughout the United States, given that recovery efforts for communities are long-term as well." AshBritt General Counsel Jared Moskowitz says that while the firm has worked with Witt O'Brien's—"they have monitored us dozens of times," he says—the company has never contracted directly with Witt O'Brien, which is typically hired by cities or municipalities to provide a monitoring role. "We've never hired [Witt]," he says. "He's never worked for us. We've never worked for him." And despite the well-publicized announcement of the "partnership" in Coffey Park, Moskowitz stresses that "there is no connection between AshBritt and Darius Anderson. The suggestion that AshBritt made the donation because of some connection to Darius Anderson, is unequivocally false," he says. Moskowitz also takes strong issue with Bennett's characterization of the company as as "right-wing" firm, noting that, for example, AshBritt was a big contributor to Hillary Clinton and is a major donor to the Democratic Gubernatorial Association. Besides his job as AshBritt's general counsel, Moskowitz is also a Democratic Assemblyman in the state of Florida. Even as James Lee Witt has been extracted from any local AshBritt-Anderson intrigues, a preliminary review of local post-fire contracts that Santa Rosa, at the request of the Santa Rosa Fire Department, entered into an $89,000 contract with Witt O'Brien's on June 19 for a professional services agreement "for the production of a city-wide after-action report." Correction and clarification: Superstorm Sandy was in late 2012, not in 2013, as an earlier version of this story reported. This story has also been updated and corrected to reflect the nature of Ashbritt's interactions with Witt O'Brien's following Superstorm Sandy, and includes additional comments from AshBritt General Counsel Jared Moskowitz that were not a part of the original story.